Stop and yield the right-of-way. If you approach a flashing red light, treat it the same as you would a stop sign. Come to a complete stop, yield the right-of-way when necessary, and proceed when it is safe to do so. If the vehicle you are following has a slow-moving vehicle symbol. 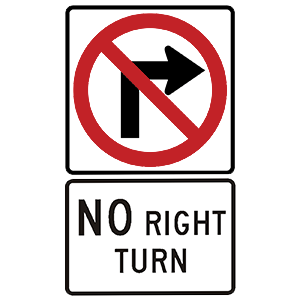 When using the right lane to pass a left-turning vehicle. It is against the law to pass any vehicle within 100 feet of a railroad crossing or intersection. Only pass where it is safe and legal to do so. A two-second following distance may be sufficient under normal conditions for an experienced driver. An inexperienced driver should maintain at least a three-second following distance under normal driving conditions. At speeds of 40 mph or faster, a four- to five-second following distance is recommended. When driving under ideal conditions at speeds slower than 40 mph, experienced drivers should maintain a following distance of at least two seconds. An inexperienced driver should maintain a following distance of at least three seconds. When driving under ideal conditions at speeds above 40 mph, drivers should increase their following distance to four or five seconds. Increase your following distance when anything makes conditions less than ideal.